There’s been a good deal of talk about neighborhood schools in the community meetings. New Century Tech High School [NCTHS]/Columbia has no neighborhood. Look at the far left edge center. See where there’s a bulge in the yellow? That’s the NCTHS/Columbia campus. Page 60 of the demographer’s report has a street map. 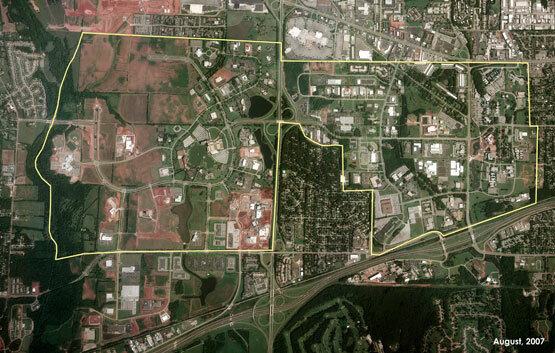 There is a residential area west of the campus — but it is the City of Madison. One of the more heated exchanges at the June 16 community meeting was between the New Century Technology High School [NCTHS] parents and the ex-superintendent. The NCTHS parents maintain that securing a location for NCTHS in Research Park preceded the decision to also place the new Columbia High School on that site. Try as I might I haven’t been able to find a timeline — yet. But my inclination is that the parents are probably right because their explanation makes sense of why this campus is where it is. According to them, there had to be a zoning variance for the school to be built in Cummings Research Park, and the reason that happened is because NCTHS and the businesses in Research Park are partners in educating the NCHTS kids. Keep that in mind. Words matter. Names matter. Because people hear that NCTHS is housed in Columbia High, they think that Columbia is the host and NCTHS the guest. But that isn’t true. Near the Sparkman Wal-Mart there is a facility containing both an A&W and a Long John Silver’s. Does the A&W house LJS or does LJS house A&W? Neither. Or both. Back to the Facility Utilization Study. I discussed the cluster fallacy and pages 41-46 already, but I have one more comment. Page 46: Lee High table. Capacity is 1672 for Lee High; enrollment in 2005/06 was 870 and in 2010/11, 807. Is this 1672 capacity figure for the Lee High that is being built? For the old Lee High? Either way, why, oh why, oh why, did a 1672-desk school either need building or replacing for an 870-person student body? Page 47: Non-Attendance Zone Schools and Special Programs. We have some problems here, folks. The Academy for Science and Foreign Language [ASFL] and Davis Hills Middle School share the same address: 3221 Mastin Lake Road Huntsville, AL 35810. On page 47, ASFL’s capacity is 768. On page 45, Davis Hills’ capacity is 697. Does this mean that the facility located at 3221 Mastin Lake accommodates 1465 kids? I don’t think so. New Century Tech High School, in contrast, has no capacity (it shares an address with Columbia HS). Page 47 and page 60. On page 47, NCTHS’s 2010/11 enrollment is 304. On page 60, a map purporting to show the home location of these 304 students, placed after the report’s recommendations, claims the total enrollment is 292. No year is provided. Does this mean the table is using 2010/11 figures and the map — well, what? 09/10? 08/09? 07/08? 06/07? Not 05/06 — that figure is provided as 215. Sloppy, sloppy, sloppy. And I won’t even begin to try to guess why the Demog Duo of Salmon and Wilson claim that the NCTHS enrollment was 304 last year and will be so again in 2015/16 and will be so yet again in 2020/21, world without end. But one of their recommendations is that NCTHS be moved to Lee –out of Cummings Research Park and to the opposite end of the City. Remember, NCTHS does not have a stand-alone facility. It’s not like there’s a building to sell, or land to sell after razing a building. Let me remind you: the reason for paying Salmon $70,000 and Wilson an additional $500 a day was to gain factually based recommendations on how to immediately save the system money. How will moving NCTHS save one penny? That’s it, that is what I want to know most of all. Pages 48-59, 61-62: Recommendations. These are presented in a great big font to bulk out the study. One page would have sufficed. They aren’t worth discussing. Comment on this post can be found here. This entry was posted in Demography (so-called) Study, Education, Fiscal Responsibility and tagged Academy for Science and Foreign Language [ASFL], Columbia High School, Cummings REsearch PArk, Education Planners, Facility Utilization Study, Georgia, Huntsville, Huntsville City Schools, James Wilson demographer, Lee High, New Century Technology High School, Steve Salmon demographer by Laurie Frost. Bookmark the permalink.